The use of cheap home insulation in China is being blamed for a massive rise in emissions of the CFC-11 gas, which is affecting the earth’s protective ozone layer. The green campaign group Environmental Investigations Agency (EIA) has found widespread use of CFC-11 in China, even though the chemical has been banned since 2010. Scientists were extremely puzzled by the mysterious rise in emissions. But a report published by EIA suggests the key source is China’s building construction industry. Just two months ago, researchers pointed to the expected decline in the use of CFC-11 after it was completely banned eight years ago had slowed to a crawl. There were suspicions among researchers that new supplies were being made somewhere in East Asia. And from concerns among some experts that the chemical was being used to secretly enrich uranium for use in nuclear weapons, the reality it seems is more about insulation than proliferation. CFC-11 makes a very efficient “blowing agent” for polyurethane foam, helping it to expand into rigid thermal insulation that’s used in houses to cut energy bills and reduce carbon emissions. It is said that up to 70% of China’s domestic sales use the illegal gas because it is said to be of better quality and much cheaper than alternatives. The authorities have banned CFC-11 but enforcement of the regulation is poor. The EIA says that its estimates of the amount of the gas being used in China are in the middle of the emissions range calculated by scientists in their report in May. The scientist who first highlighted the problem with CFC-11 said the EIA findings seemed plausible, although it was difficult to be definitive. China’s polyurethane foam makes up about one-third of global production, so if they are predominantly using an ozone-depleting substance it will set back the closing of the ozone hole by a decade or more. 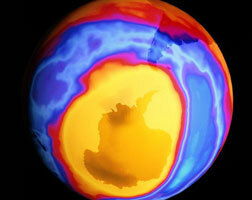 As well as the ozone layer, CFC-11 has a warming impact. Researchers estimate that if the use of the chemical continues, it would be the equivalent of CO₂ from 16 coal-fired power stations every year! As China is a signatory of the Montreal Protocol that governs the use of ozone-depleting substances, it should be possible to put trade sanctions in place. However, since the protocol was signed in 1987, this weapon of last resort has never been used and it’s not expected in this case. What’s more likely is that China will be encouraged to crack down on the production of CFC-11s and to launch a full-scale investigation with the support of the Montreal Protocol secretariat. Ozone is formed in the stratosphere some 15 to 30 km above the surface of the earth by the interaction of solar ultraviolet radiation with oxygen in the air. In this location, the newly formed ozone absorbs ultraviolet radiation, preventing most of it from reaching the ground. This is important because ultraviolet radiation can lead to skin cancer and eye damage in humans, can damage crops and marine life.